To the disappointment of many users, Safari hasn't traditionally offered much when it comes to saving your sessions. Re-opening your tabs from your last browsing session is not very automatic (or obvious), and Apple has simply wished us “good luck” in the past when it came to opening a specific set of tabs on each Safari launch. At least, until Safari 4. 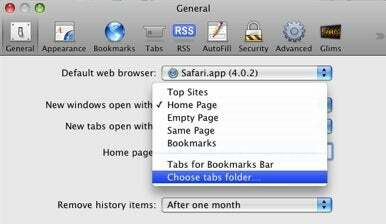 In Safari 4, Apple added a preference that lets users open a specific set of tabs on each Safari launch or new window. The setting is found in Safari’s General preferences pane, under the “New windows open with” feature. Selecting the “Choose tabs folder” option at the bottom of that menu allows you to pick any folder of bookmarks from your Safari collection. This is pretty handy for any number of reasons, all of which basically boil down to browsing more efficiently. If you’re a multi-account webmail junkie, a Safari tabs folder that holds bookmarks for your Gmail, Yahoo, MobileMe, and work email can be opened automatically in each new window, saving you precious time when you have to get down to business. News ninjas will probably want to use a tabs folder containing a favorite newsreader, mainstream news sites like New York Times and CNN, a handful of favorite blogs, and their own blog for publishing some interestingness. The possibilities are, quite literally, limited only by the size of the Internet and your threshold of waiting for Safari to open a bunch of tabs. It would still be nice to see more session-related features arrive in Safari without the need for plug-ins InputManagers like Glims. But this new tabs folder feature is at least a quiet sign that Apple is listening to requests for more Safari functionality.